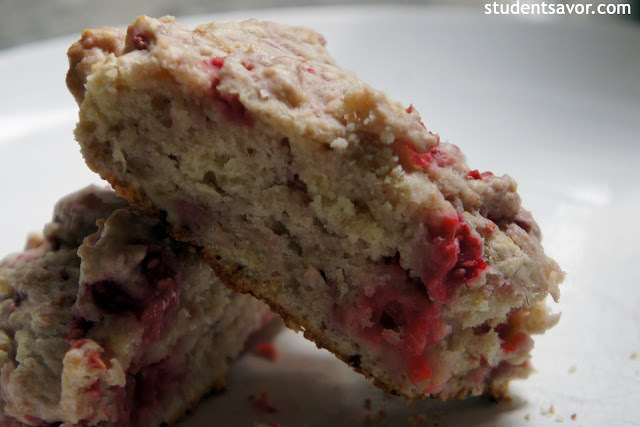 Woke up this morning with one thing in mind: scones! 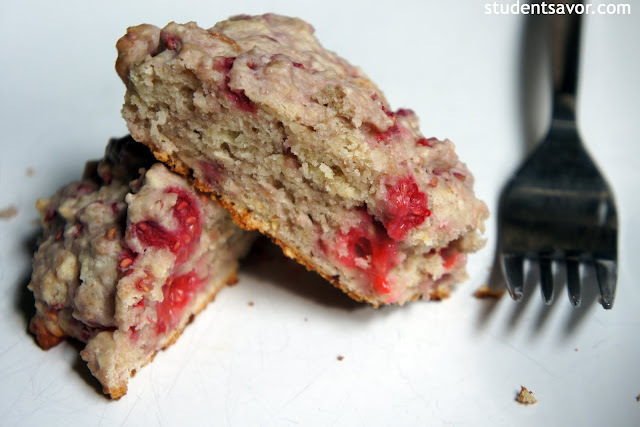 It was probably since last night I was reading this month's Martha Stewart Living (one of my many favorite magazines) and I came across what looked like a delicious recipe for berry scones. They are part of a foraging series in which all the recipes supposedly include ingredients from the forrest, but mine include berries straight from the cool climate of the refrigerator. But first a quick recap on my life. This week has been non-stop journalism (which is totally called for since my internship is about to come to an end). Both the fact that my internship is coming to an end and that I will be leaving Boston in about a week make me very sad, so cooking is once again my therapy. Last weekend I went to NYC to visit my sister for her 18th birthday. One of the best weekends in my life. One of the most tiring ones as well. Anyways I ate at a lot of delicious restaurants, and I think they all deserve a shout out. First there was Scarpetta. Located smack in the middle of Meatpacking District, this italian restaurant set my standards for NYC cuisine way too high up. An appetizer, two entrees, two desserts and some wine made my sister's birthday dinner celebration all that much better. Yes, it is on the pricy side, but what can you expect from a birthday dinner in NYC? Every buck was well worth it. Hands down the best black cod I have had at a restaurant. Saturday morning called for a late breakfast in Chelsea. We went to the Chelsea Square Restaurant where I had one of the biggest omelets of my life along with a weak--but not too bad--cup of coffee (or two). This diner was the perfect place to balance out the elaborate cuisine we had dined the night before: simple home-like dishes in copious quantities for a reasonable price. Lunch didn't happen until around 3:30 p.m. (due to our late breakfast and various mishaps along the way). Tresanti, another italian restaurant--hard to think that my sister used to never choose italian food--was ideal for my sister's birthday lunch celebration. Ten of her friends, one of mine, my sister and I made up the largest--and loudest--table in the restaurant. My meal was a simple salad that doesn't deserve too much praise, but the bread was a m a z i n g. Do not hesitate asking for more and more baskets if you ever get a chance to eat there. Really, it is delicious (and believe me, I have had my fair share of breads to compare it to). Ok. That is it for now. More NYC foodie adventures will come in my next post, but for now, enjoy the scones! And if you really really want one and you live close to me, just stop by and ask for one (let me know beforehand of course). In a large bowl, whisk together flours, sugar, baking powder and salt. Drop butter into flour mixture and mix using your hands. 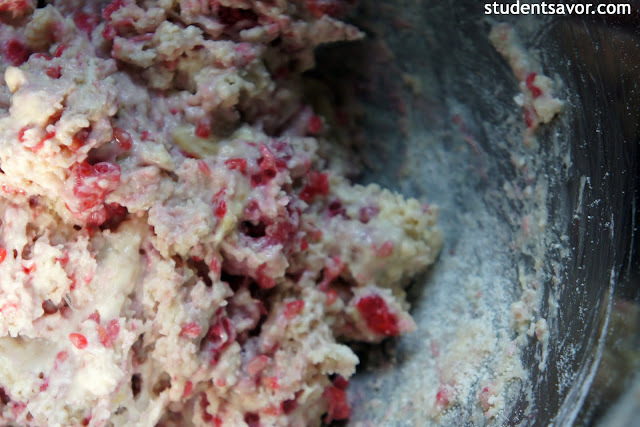 Squeeze each piece of butter and the dry ingredients with your fingers until only pea-sized butter pieces are left. 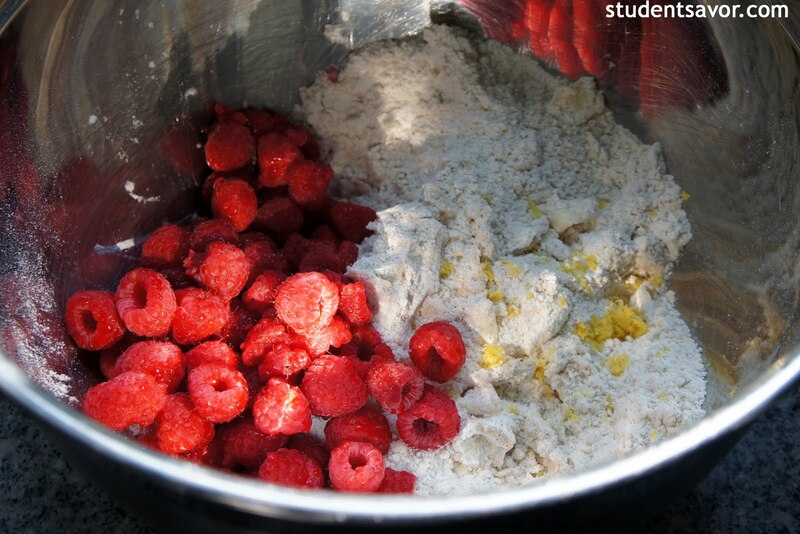 Add raspberries and carefully combine. 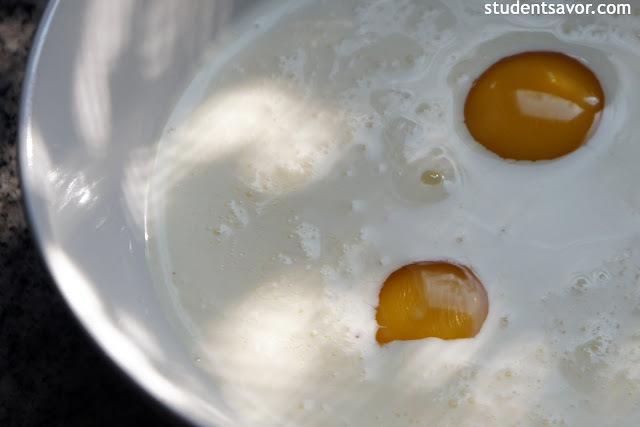 In a separate bowl, whisk together cream and eggs. 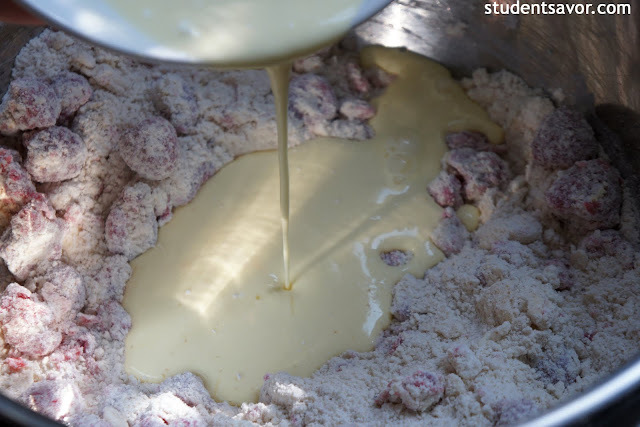 Make a well in the flour mixture and slowly pour cream and eggs. With a fork, carefully combine cream and flour mixtures just until dough forms. Line a baking sheet with parchment paper. Separate dough into 8 pieces (I made 6 and they were huge!) and transfer to baking sheet. 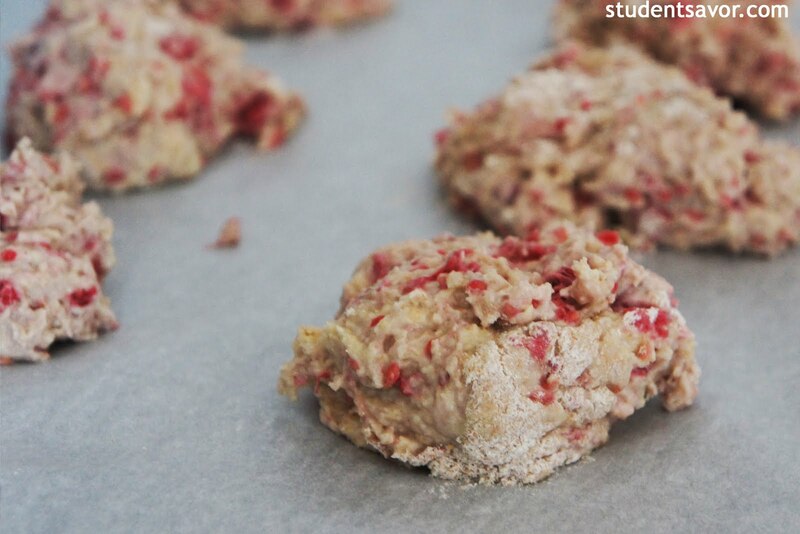 Bake scones for 20 to 22 minutes or until golden brown. Let cool and serve.